Tempura is a Japanese batter, used for frying little odds and ends. Typically, it’s tempura shrimp, vegetables, sweet potatoes, etc. 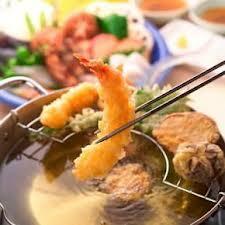 A very light batter, tempura frying will always result in a very crispy and light product. Tempura fried items also take sauces very well. Tempura fried pickles with ponzo, tempura fried prawns with ginger soy.. you get the idea. Tempura almost always needs a dipping or finishing sauce, because the batter itself is somewhat bland. It’s crispy, which is excellent, has a little salt, which is necessary, but is inherently ‘incomplete’. It requires a spicy, salty, citrusy, highly seasoned sauce to create that balance. In this case, the balance is the anticipated and expected soy based salty flavor we all love. Anything can be tempura battered and fried. Of course, the ideal subjects would be Japanese in nature, such as hand-rolls, sweet and sour eel, and the usual vegetables and shellfish. I love tempura oysters. I love tempura kampachi. Dipping sauces can be intimidating. Balance is critical, and knowing how to balance them can be daunting. When in doubt, just use low sodium soy sauce mixed with a little sugar, sliced scallions, ginger and 1 thai chile. That will cover most of your needs. Place all dry batter ingredients (flour, corn starch, etc in the freezer for 30 minutes prior to making the batter). Mix the flour, salt, corn starch and egg yolk with soda water until a semi-thick batter is created. Keep everything as cold as possible. Heat a small sauce pot of vegetable oil to 350 degrees. Dredge the shrimp in a little flour, coat it in the tempura batter and fry until cooked through (slightly golden brown).